Certain contrast agents used during magnetic resonance imaging (MRI) may accumulate in specific brain areas and contribute to disease duration and severity in patients with MS, according to a new study published in the Multiple Sclerosis Journal. The study, “Gadopentetate But Not Gadobutrol Accumulates In The Dentate Nucleus Of Multiple Sclerosis Patients,” was conducted by researchers from Charité – Universitätsmedizin Berlin and the Max Delbrück Center for Molecular Medicine in Germany. MRI scans are frequently performed using a contrast agent called gadolinium — a rare earth element — which can accumulate in the brain with every scan. Although there is no evidence as to whether these deposits can interfere with the brain, the concern persists among doctors and patients. The possibility of gadolinium accumulation causing any changes in brain activity is of particular importance to MS patients, who usually develop symptoms as young adults and are submitted to more contrast-enhanced MRI scans during their lives. 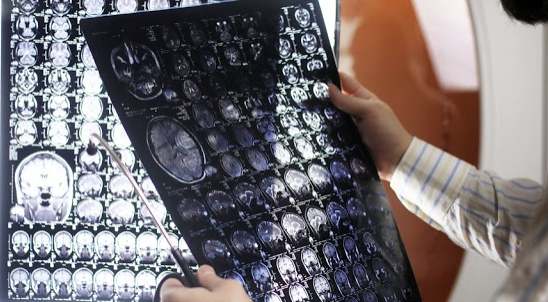 To investigate whether gadolinium-based MRI could induce changes in the MS brain, researchers analyzed gadolinium deposition in 97 MS patients who had been submitted to 265 MRI scans with and without the use of gadolinium. Patients had exclusively received one of two gadolinium-based techniques using either gadopentetate dimeglumine (Gd-DTPA) or gadobutrol (Gd-BT-DO3A). Results indicated that patients receiving Gd-DTPA had higher levels of deposits in an area of the cerebellum compared to patients receiving Gd-BT-DO3A. This suggests that the contrast agent Gd-DTPA allows gadolinium accumulation in the brain, which may potentially be related to disease duration and severity in MS patients. “Patients who received a different type of MRI contrast agent — one that is referred to as a macrocyclic contrast agent [Gd-BT-DO3A] — showed no evidence of gadolinium brain deposition,” said Michael Scheel, senior author of the study, in a news release.